Aerocube 8 is part of the small satellite program of The Aerospace Corporation, El Segundo, California. The AeroCube program deploys small satellites for technical demonstrations. Each of the two AeroCube 8 satellites is 1.5 Units in size and hosts a new electric propulsion system, new nanotechnologies and new innovative solar cell technologies that are to be tested in an operational space environment. The AeroCube 8 satellites demonstrate a Scalable ion-Electrospray Propulsion System (SiEPro) that is based on the extraction and acceleration of heavy ions using strong electric fields applied at the interface between the propellant and the vacuum of space. The system uses field evaporation to generate charged particles which has the advantage of not needing any reaction volume for the production of ions. Typical ion thrusters require a reaction chamber into which a molecular gaseous substance is injected to then be ionized by electron bombardment or other methods. Additionally, the propellant, held by a porous substrate and guided through planar emitters, does not need to be pressurized and flows exclusively by capillarity forces. Eliminating propellant lines, valves, tanks and pressurization complies with the size and weight limitations of CubeSat designs. Typically, the propellant used by the system is a liquid-salt that is non-toxic and held inside a plastic tank as main propellant reservoir. Atop the tank is a porous material that guides the fluid to a few hundred pointed tips made of metal. Flow of the propellant through the porous material is accomplished through the use of capillary forces. The porous material holding the propellant is comprised of silicon with micro-fabricated porous metal substrates that contains the ion emitting structures. 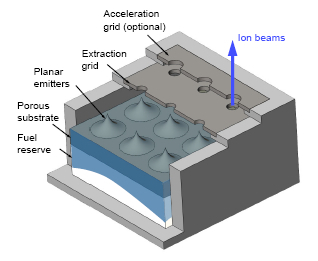 Located above the ion emitting structures is the extraction grid that is biased at voltages of up to 1000 Volts to extract the ions from the ion emitting structures and provide initial ion acceleration. An optional pair of accelerator grids can be installed atop the extractor to further accelerate the ions. As the high-speed heavy ions are ejected, the spacecraft is accelerated in the opposite direction according to Newton’s third law. Overall, the thruster module is about 10 by 10 by 2.5 millimeters in size. A total of four SiEPro modules would be needed in a minimum configuration for CubeSat attitude control and main propulsion. SiEPro can also be used for CubeSat Deorbit maneuvers, formation flying and missions beyond Earth orbit. Typical 3U CubeSats would feature 32 SiEPro modules for attitude control and main propulsion. 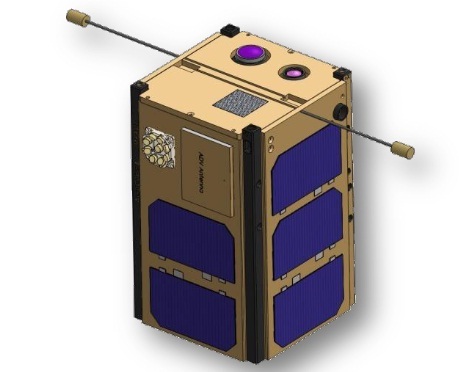 The AeroCube 8A and 8B satellites also demonstrate the use of a light-weight harness and the use by Carbon Nanotube radiation shielding for application in future satellites. In addition, the satellites demonstrate the use of quadruple-junction inverted metamorphic multi-junction (IMM) solar cells and quintuple-junction Semiconductor Bonding Technology (SBT) solar cells.